In short "A genuinely outstanding experience". This is how I read it- I started on Thursday. I finished on Monday and I don't know what went on in this world in between. I think just like Mr. Wind-up bird, I was stuck in my own well as I was recovering from my own darkness. I could see through the events like they were happening right within me. I got terrorized, I got shaken, I got enthusiastic, I was trying to find my baseball bat to find the strength in me. I was trying to find meaning, I was trying to find solace, but I was just being thrown into even more void, but eventually, I was feeling stronger and stronger; braver and braver. I could know love in a much more deeper place in my heart, I could learn how to let go, I could learn how to be not afraid amidst big walls that are suffocating me. I can replay the entrance and exit of each character on the scenes of my mental stage. Some were pushing me, some were pulling me. And in the end, I was wound up. But I think I discovered more than ever at the same time. 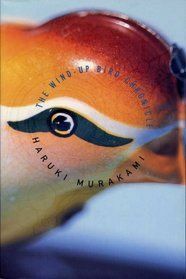 Sign into Goodreads to see if any of your friends have read The Wind-Up Bird Chronicle.